With thanks to Eye of the Fish for permission to repost. For those of you that don’t have any objection, there is always the chance to make a submission supporting the scheme. There’s just one slight hitch: it has been designed as a bit of a background building, and I really can’t get too excited about it. This is an existential problem – we can’t have a city where all buildings are shouting wildly in a Kath and Kim voice: “Look at moee, look at moee! !” – although its hard to tell an architect to do something quiet and demure. Architects (poor bastards) are always wanting someone to love them, normally by designing some dead-gorgeous building that knocks your socks off and takes your breathe away, like Tom Cruise meeting Kelly McGillis in Top Gun. Only, in this case, they’ve agreed to design a building that blends into the background, somewhat like a load of old shipping containers. I’m surprised that anyone would hire Athfield Architects to design a “blend into the background” building. They’re not known for that sort of design. Sensitive and shy and retiring are not their middle names. They’re good at – or used to be – stand out, clever design, quirky design, not meek and mild. 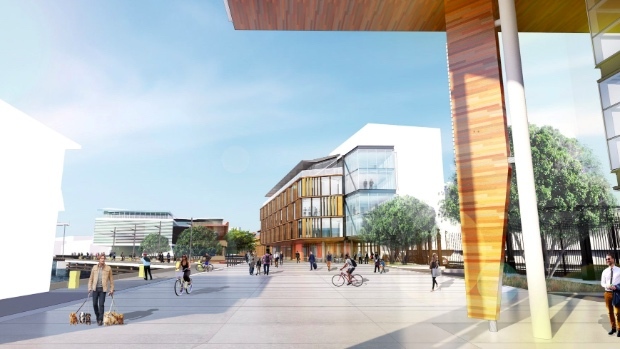 Annnnnnnywaaaay, what’s the proposed building like – and what’s it for? Does it stand out – and should it stand out? Like other buildings built on the waterfront recently, the ground floor is reserved for “public use”. The upper floors are planned as spaces for offices, or something like that, which probably means more unwelcome corporate money launderers like PWC or Deloitte or a private Bank etc. They’re the only people with pockets deep enough to afford the rent. But, like, whatever – the ground floor is still totally for the Public, right? The big chance for the Public – i.e. “We the People”, was in the last building – site 10, now home to PWC. 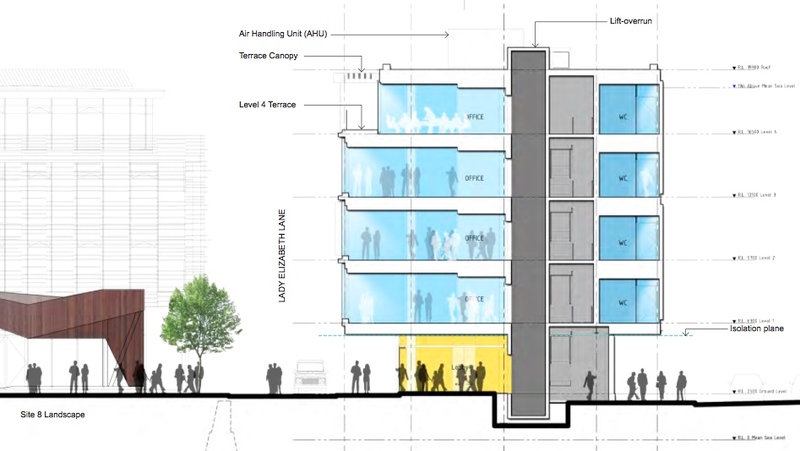 The proposal was for a large part of the Ground floor to be completely available to the public. There was also a top floor, public look-out deck, also available to the public. Either of these functions would have been fantastic – but both of them, together, would have been brilliant. Well, sure, site 10 – the PWC building – has a couple of shops for unwearable clothes or cafes or something opening on the ground floor, but a place where you have to pay to have a drink, is not really a “public place”, its no different from a thousand places all around town. And I’m betting that the new building will have “public places” just like this. There are 3 ground floor “public spaces” in the building – one tiny shoebox, no doubt destined to be yet another coffee bar – like we really need more of those? I don’t think so. So what do we do? 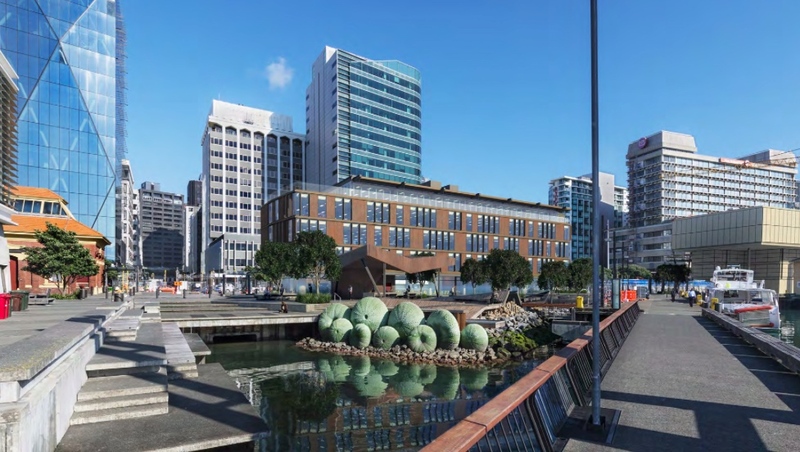 Should we support the building of a new building on the waterfront in Wellington? Should we object to it? Should it stand out and be proud and claim “here I am!” ? or should it quietly and demurely fade into the background, pretending that it is nothing more than a pile of used containers, waiting patiently on the wharf for a straddle-crane to take them away? I’m inclined to say that a building this bland excites me not, and that it is boring and ugly. It has no place on our waterfront, unless there is a significant benefit to the public. 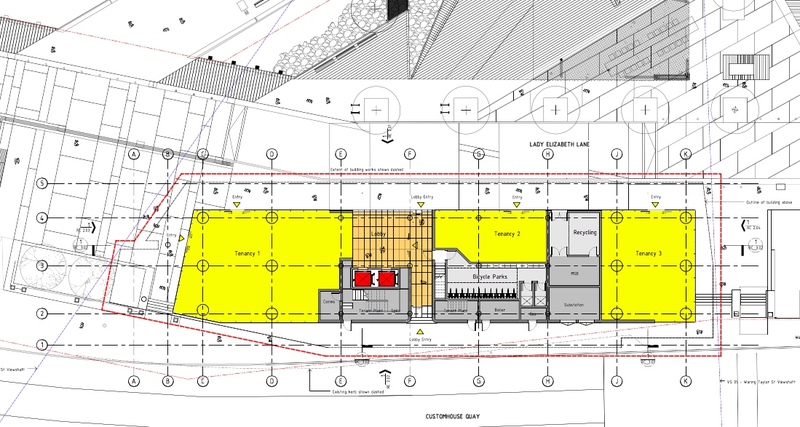 That public ground floor space we missed out on at site 10 – surely that has to be the minimum price for having a building on the waterfront? And should there be a rooftop public deck as well? Well, that would be nice, but i think that particular boat has already sailed. There’s no chance they’ll be offering a rooftop observation deck on this building, at least not for the public, not after Waterfront Watch truly screwed the city on the last chance. There’s a deck there to be sure, but its not for the like of you and me, its for rich corporate people who can afford the rent but don’t have the grace to invite the plebs up there. Plebs. Workers. You and me, buddy. Yes indeed, I’m still royally pissed off at Waterfront Watch for spoiling the one good chance that Wellington had at a decent public space. Have you ever tried to organise a small exhibition in Wellington? A gig of some sort? A space or place where you could put up a small display for a week or two, without paying through the nose, or be given only a space the size of an A4 sheet? 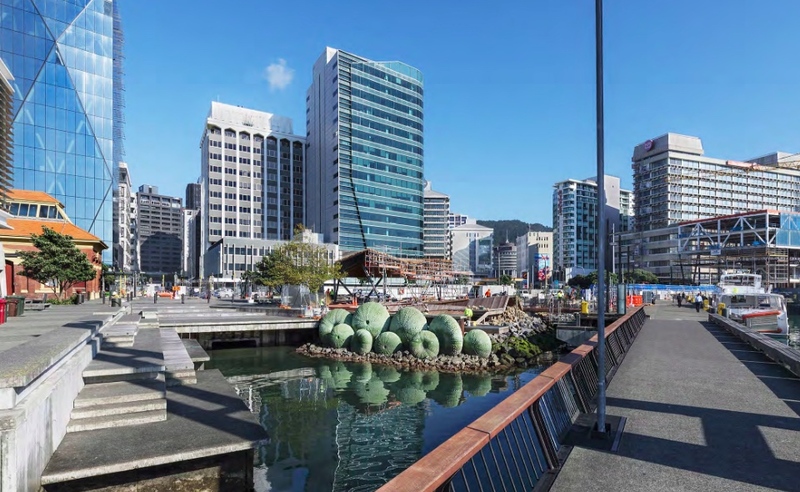 People of Wellington deserve a space for all Wellingtonians – a Living Room for the City, for those rare, highly infrequent days, when the weather is less than perfect. Yes sirree ma’am, just like the 3 days we’ve just had full of rain and storminess. We could have had a good space for everyone, and a top deck with views to die for, but Waterfront Watch ruined that for everybody, for all time. Now all we’re left with is – nothing. You want to post something on a wall? Grab a spray can and tag it yourself, just like everyone else does these days. So: what say you then? 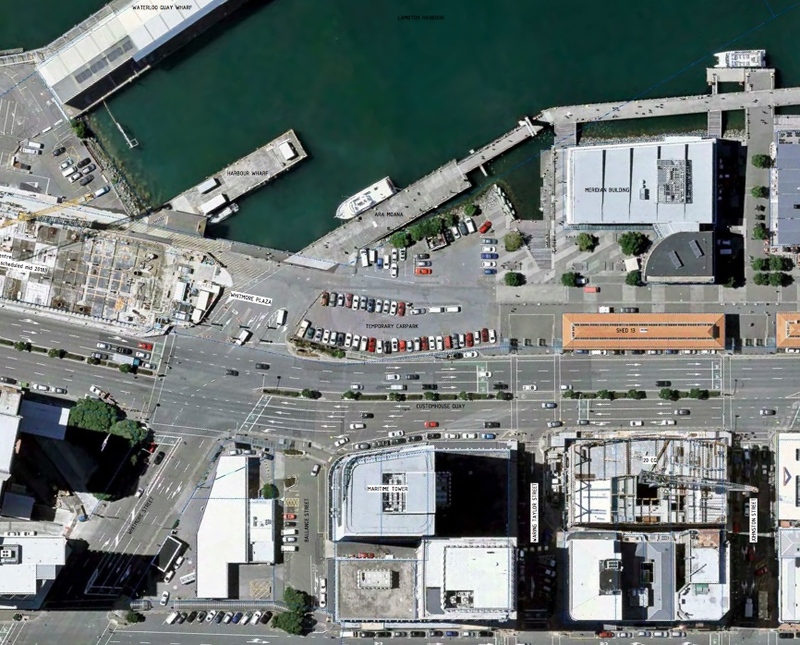 I say: no building on North Kumutoto without a brilliant piece of architecture, no building at all without a significant covered public space, or public purpose, without something substantial for the People of Wellington. No building as bland as a bunch of containers in a pile. No “boutique offices” or “boutique apartments”. We deserve better than this. What say you? Have your say. Thanks again to our friends at Eye of the Fish for the repost. Make sure you get your submissions in to nix the naysayers!